What do Tom Cruse, Sam and Luke James as well as Tom Hudson have in common? Other than playing for their respective Gallagher Premiership clubs, the aforementioned quartet all have a chapter in their rugby careers under the title of Wilmslow High School. Over the last few years, the Cheshire school has produced some fine rugby players and one of the recent promising talents to have been educated in the North-West is Callum Atkinson. Atkinson is currently a second-row for Pro 14 side Edinburgh, whom he officially joined on a 12-month deal in the summer. 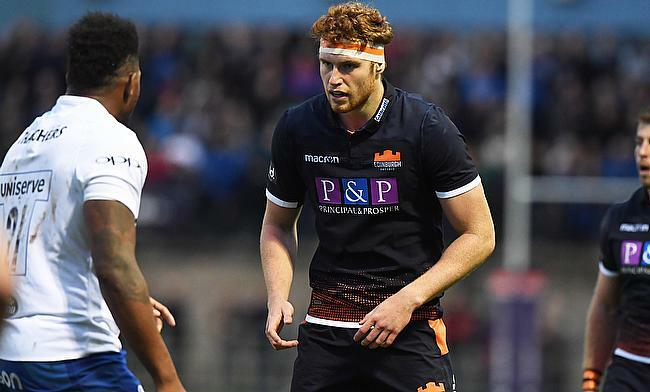 The 21-year-old has already been part of the first-team after recent appearances against Zebre and Scarlets in what has been a whirlwind 2018 for the lock. It is a different avenue to the paths which Cruse, the James’ and Hudson went down, but while they all may have harboured ambitions of making it in the game after completing their studies at Wilmslow High, the thought of pursuing a career in rugby never crossed the mind of Atkinson. Once he shut his books for the final time in Wilmslow, his next stop was university. He reveals he didn’t play rugby in his first year at Heriot-Watt because he “didn’t have the interest”, but he did go on to join Tennant’s Premiership side Boroughmuir. It was here where his rugby journey began to spark into life. After an impressive five games with Boroughmuir, he was noticed by the then Scotland U20s head coach Sean Lineen and with Atkinson’s mother, Lynn, originating from Glasgow, he was eligible to be included in one of their squads. Injuries and other circumstances denied Atkinson of a cap at U20 level, but following on from this, he was offered a BT Sports academy contract with Edinburgh and was also sent to Stellenbosch Academy by the SRU to train in South Africa for six months at the start of this year. “I didn’t have any thoughts about playing at all,” says Atkinson. “I had never been picked up by anything or anyone before so I went up to Uni. I just played for school and that was a very high standard. At Uni, I joined Boroughmuir and then I played a few games for them. When I was playing for them, a lot of people realised I was Scottish qualified. He also, inevitably, puts his rapid rise in the game down to his development at Wilmslow High School. During his time there, Atkinson reached the NatWest Cup Semi-Final at Saracens’ Allianz Park in 2015, but Wilmslow, who also had Luke James in the side, were beaten 50-14. Appearances in the latter stages of the National Cup competitions is not a rarity for Wilmslow with the 2010-11 side also making the final four, but an inspired performance by a certain Elliot Daly denied them of a place at Twickenham. “When I was at high school, that was when rugby started to become a bit more of a thing for me,” he says. “In my year, we got to the NatWest semi-final and from there, I didn’t really have anything lined up so I went to Uni and it has snowballed from there. While Wilmslow gave him the platform, his experiences within the Scotland set-up was when Atkinson started to realise a career in the sport was a viable option. Previously, he had not been involved with any of their age groups, but since his time with the U20s squad and his spell in South Africa, Atkinson has taken everything in his stride. “Scotland U20s was very, very daunting at first,” Atkinson adds. “I went down to Boroughmuir because it was near my flat. That’s the only reason I went because I wasn’t interested in playing when I first came to Edinburgh! “I went to do it almost socially, but I knew it would be a good standard. I think I played a few games for Boroughmuir and then I got a phone call from Sean Lineen asking me to come down. I never actually played a game due to a few little injuries that prevented me from getting any consistency in the training, but just being in the environment was such a shock to me. The disappointment of not making an appearance for Scotland soon disappeared for Atkinson because back in January, he went out to South Africa and it was in Stellenbosch where his life changed forever. “When I got the offer to go to Stellenbosch, it switched something in my brain and I thought I could actually do this now,” he says. “I am good enough and people think I am good enough. Now, halfway through his one-year contract with Edinburgh, Atkinson’s situation will be assessed at the end of the year, but under the guidance of Richard Cockerill, he is keen to leave no stone unturned during his time in the Scottish capital. “It has been amazing so far. It really hit home when we played Scarlets as that was my first home game. All my family came up to watch too! That experience and running out at Murrayfield after training with the club for six months was pretty special. “All the lads in the changing room are so helpful and Richard Cockerill is so good with the young boys. He is harsh with you because he wants you to do well. He reads situations really well and he can tell when you need a little kick or an arm around you to help pick yourself up. “For me, I have not really got anything I want to set a goal for. So much could change throughout the season and I could turn up next week and I could get an injury. I am just trying to keep my head down. It is about learning off the people around me because there are so many internationals in that squad.